A numerical algorithm for approximate multi-parametric nonlinear programming (mp-NLP) is developed. The algorithm locally approximates the mp-NLP with a multi-parametric quadratic program (mp-QP). This leads to an approximate mp-NLP solution that is composed from the solution of a number of mp-QP solutions. The method allows approximate solutions to nonlinear optimization problems to be computed as explicit piecewise linear functions of the problem parameters. 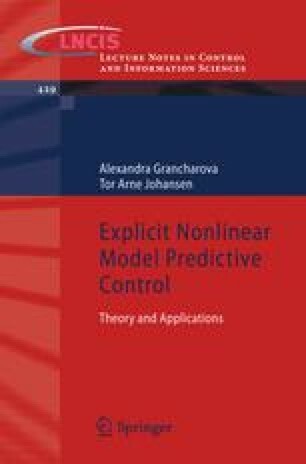 In control applications such as nonlinear constrained model predictive control this allows efficient online implementation in terms of an explicit piecewise linear state feedback without any real-time optimization.